Hello and welcome to the first Newsletter of 2014! I naively thought that January would be a lovely relaxed month, time to recharge before the manic seed sowing starts and all the other joys of Spring; how wrong I was. For those of you that read our December Newsletter you will remember that our lovely member of the month was Rachel fromCatkin. She told us all about the day the BBC came to film her for a new TV programme called The Great British Garden Revival. Well, the episode that featured our Rachel (shown on January the 6th) certainly caused a positive stir in the British Flower world. I must say I didn't have the chance to watch the programme properly at the time because twitter went frantic and I struggled to keep up with the conversation. Our website saw a huge surge in views and we have since had many emails from businesses wanting to be a part of The British Flower Collective. Many of our members also saw a flurry of emails requesting British Flowers, myself included. One of the things I love about TBFC is being able to refer work I can not take on myself as BareBlooms towards TBFC website knowing that there are lots of trusty businesses that share my passion for British, Seasonal Flowers that will be able to help them out. Rachel Petheram from Catkin and Rachel de Thame filming for The Great British Garden Revival Programmeshown on the 6th of January. A week later, following on from the Great British Garden Revival high, was the Flowers from the Farm South West meet up of flower growers at Cullompton in Devon. This is the second year this gathering has taken place and it was lovely to meet up with TBFC members new, old and 'to be'. This year the format was slightly different with more structured seminars. You can read a bit more about the day from one of our members Georgie at Common farm flowers on her blog. Now Devon isn't exactly next to Powys/Herefordshire (which is where I live) so this year I decided to make more of an event of the trip and booked a self catering barn near Cullompton the night before and night after the event. Inviting all the local flower ladies to me. I am so glad I did this as it was a perfect way to get to know people better actually living together for a few days and sharing meals. It felt like school camp but much much better, and there was a lot of talk about flowers. In fact I think the one and only time we all shut up was to watch 'Sherlock' on Sunday night !! We also had the pleasure of Lindsey Kitchin joining us last minute for one night from The White Horse Flower Company. None of us had ever met Linz before but I had built up a 'virtual friendship' with her on Social Media and felt like I had known her for years. This is one of the great advantages about Social Media; so many lovely flowery friends. Still on the subject of the Cullompton meet up; over to our regular feature from Victoria from The Flower Garden at Stokesay Court to see what she has been up to in January. Make money. Work out who our customer is, what she wants and what she will happily pay a premium for, and then create this product. Enlist all the help we can. This includes the local economic development officer, the Federation of Small Businesses, the local and national press, family, friends... anyone and everyone. The brand. Firstly, creating and promoting a world which will enthral and entice our potential customers. Secondly, behaving with professionalism; “promise and deliver” as one of the speakers said. I'm also looking forward to trying ideas such as selling flowers by the stem at the farmer's market, as a kind of florist theatre where the customers can have bunches made up exactly as they wish, and saving me time the day before so that I can make up other orders. Using social media really doesn't come naturally to me (how do people possibly have the time?) but I will try to take some of the advice offered about this too, including to communicate authority and experience in our field, showing that we are confident about the worth of our wares and that we know what we are talking about. With all this whirling round in my head, it's been back to the garden in a squelch of mud and a flutter of insubstantial waterproof clothing. We have been weeding the brick and gravel paths by hand, tiring and a bit 18th century perhaps, but it's great to know that we're not pouring chemicals into the soil, and even better to feel that I've really earned that gin and tonic by the fire. This month also saw Victoria have an article published in the quarterly gardening journal 'Hortus'. Thanks to Victoria for mentioning The British Flower Collective as well as some of our members and congratulations at getting her work published in such a prestigious and exquisite journal. If I had to choose a flower to represent January it would always be The Narcissi. I always force a few a 'Paperwhite's', 'Bridal Crowns' and 'Erlicheers' to brighten up my dark, January home. At the far end of Britain these deliciously scented blooms are growing outside, fields and fields of them, so this months Member of the Month always has to beScented Narcissi in the Scilly Isles. At this time of year the fields on the Isles of Scilly are quite literally bursting with flowers. Scented Narcissi have made a few changes recently in time for their busy season (now!). They have changed their logo, packaging and website resulting in a boost in sales. Each order now contains a 'farmers tag' which lets the customer know not only which variety they have but also the farm and farmer that grew them. The response from customers has been great, the public genuinely seem to be interested in knowing where their flowers came from and have now been able to thank the individual farmer on facebook, etc. This location awareness is an encouraging trend for all of us British Flower growers/sellers/users. 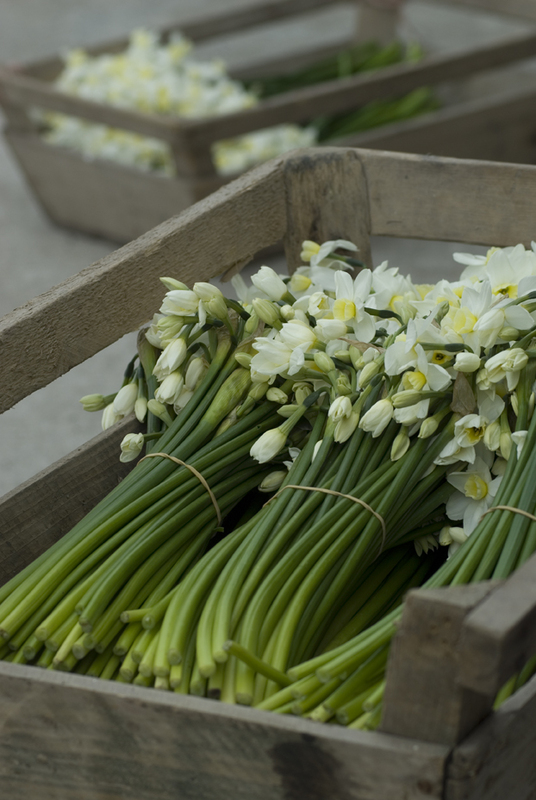 Valentines day will soon be upon us and Scented Narcissi are having a big push to encourage the public to buy British. Who wouldn't want blooms as gorgeous as this from a loved one rather than some imported red roses. The double headed, creamy petaled Erlicheer is described as a flower "for a young woman in the first glow of love", perfect for Valentines Day. - The Pyrus ladies have been featured twice on The Natural Wedding Comapany blog with a lovely real wedding feature and also as part of the 'day in the life' feature. They were also featured on the Flowerona blog about the trend for dark florals. - The Garden Gate Flower Company ladies have been busy with two photo shootsfeatured in Wed Magazine and in a Japanese wedding magazine. You can also now sign up to receive a Newsletter from them.